Sell multiple products - from multiple websites - with just ONE ClickBank account. Boost your Page Rank in search engines by using the power of Link-Popularity. Build an army of loyal affiliates easily with this powerful tool. Boost your ranking in the ClickBank Marketplace. Automatically sends email notification to your affiliates each time they make a sale. 100% compatible with ClickBank's Hoplink and NEW "Tracking Codes" (tid=xxxxxxxx). 100% compatible with DLG, EDP and ECG- You can now easily integrate easyClickmate with DLGuard (DLG), EasyDownload Protector( EDP). and EasyClickGuard (ECG). No need to mess with any coding. Easily Integrate with ANY autoresponder- easyClickMate will automatically capture your customers' data and forward them to your optin/squeeze page. Works with Aweber, Getresponse, 1stShoppingCart or any other autoresponder that accepts subscription via email. Personalized Sales Copy- They say you only get 1 chance to make the first impression, and that's very true in direct response marketing. What's the best way to grab their attention? Their NAME of course! Highly Customizable Affiliate Center. You can create custom messages, custom banners, etc for your affiliates. Your affiliates can simply cut and paste their affiliate URL when they login. Stop those Professional Refunders! - You know, those that purchased your product, downloaded it and then request a refund 10 minutes later. You can now STOP them DEAD in their tracks! Are you maximizing your ClickBank account for maximum profits? If not, you're missing out on a lot of potential sales. Clickbank now services over 10,000 publishers - many of these online businesses would not have existed if not for Clickbank's excellent services. However, only a handful of publishers know how to fully maximize their ClickBank account. The secret lies in overcoming restrictions with their linking system (the hoplink). 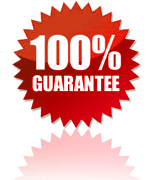 You see, ClickBank allows you to list up to 500 different products in a single account. However, your affiliates can only send traffic to one landing page - which means if you are selling 2 or more products, your affiliates are not able to promote them. easyClickMateTM solves this problem for you - plus many other features to give you the extra edge over your competitors! I just thought I would take the time to drop you a short note and let you know how delighted I am with your product easyClickMateTM. I have been using it since April 2003 and it has had a dramatic effect on my business. Not only has my page rank on google gone from a 3 to a 5 because now all my affiliates link back to my site but my business has increased. This is because I can now click a button and email all my affiliates with updates and new product releases. The last thing I would like to mention is your customer service. It has been excellent throughout. I think I must have emailed you more than any other customer and each email was answered promptly and with patience. I highly recommend your product and service." Would you like to join this elite group of successful ClickBank publishers? This powerful and versatile script will show you how. In a nutshell, it provides a custom affiliate management system that allows your affiliates to promote ALL of your products effectively! You'll have the tools to manage your affiliates without the associated administrative hassle of tracking sales and paying your affiliates! That part is taken care of by ClickBank itself. EasyClickMate is a complete system designed to boost your ClickBank income and empower your affiliates to generate more sales! Sell More with Targeted Links! This is perhaps the most important reason why you should consider easyClickmate. If you used the conventional way to let affiliates sell your multiple products, you'd have to put all your products on one page. Your affiliates cannot effectively pre-sell for you because he/she cannot send visitors to your targeted product pages. Let's say a super affiliate likes one of your products and decides to endorse it. A reader likes what he reads and decides to check it out. He clicks to your site. But instead of seeing the product he has just read about, he sees a generic page FILLED with links to all your products. This is a surefire way of distracting the customer. You've just given him many other links to explore, and chances are, you and your affiliate will have lost the sale! As a ClickBank Publisher, why risk it ? Make it easy for your prospective customers to purchase your products and your affiliates to promote your products! easyClickMateTM solves this problem for you flawlessly and elegantly - even if your products are located on multiple websites. Your affiliates will have a unique affiliate URL for each of your products that will link directly to the product's sales page! Nobody likes to be sold to. In fact, most people react suspiciously when they see an affiliate link. What if your affiliates can send visitors to a 'neutral' site, say, a professional press release and still be credited for the sale? Your affiliates could do a short write-up on your product and then send visitors to your press-release as social proof. Would this not increase your sales? This is also a neat way to attract super-affiliates - they can send visitors to their own optin/squeeze page and still be credited for the sale. Effectively, if you enable this feature (yes, you can choose to dis-able it if you wish), your affiliates have full control over where they send their subscribers. The landing page can be your pages (sales page, article page, squeeze page) or your affiliates' own pages, or a neutral page such as a press-release page. Sell More with Personalized Sales Copy! Recent studies have shown that personalization can often increase sales up to 30% when tested with a standard copy (without personalization). Also, recent demographic studies revealed that over 85% online purchases are made by women or influenced by women. From my own product sales analysis (from 2002 - 2007), the percentage of women buyers have increased significanly over the years. If you analyze your own stats, you might find similar patterns. What does all these stats mean to you? Well, women are more relational compared to men, and they respond favorably to personalization. So, if your affiliates send their subscribers to your sales page that is personalized with their name, you might effectively double your sales with this simple tweak! This is another major benefit of using easyClickMateTM - Your position in the ClickBank MarketPlace will rank higher since all your product sales are funelled through a single account. *note: Your position in the ClickBank marketplace is based on the number of active affiliates you have and your total sales. If all your sales and all your affiliates are linked to a single ClickBank account, your position in the MarketPlace will be high! "The number of sites which link to a particular site. Most search engines use link popularity as a factor in determining the search engine ranking of a web site." If your website has a high search engine ranking, (i.e. high Page Rank), you will get more targeted traffic, and thus, more sales. When you use easyClickMateTM, ALL your affiliates will be linking to your site instead of ClickBank. If you have hundreds of affiliates, your page rank will definitely improve ! Dealing with refunds are part and parcel of doing business online. However, these "professional refunders" are really getting on my nerves. 10 - 20 minutes after they have purchased your product, they will request a refund. After a while, you will notice a pattern about these people - they are usually from certain countries. This unique feature of easyClickMateTM allows you to "BAN" people from selected countries from ordering your product! 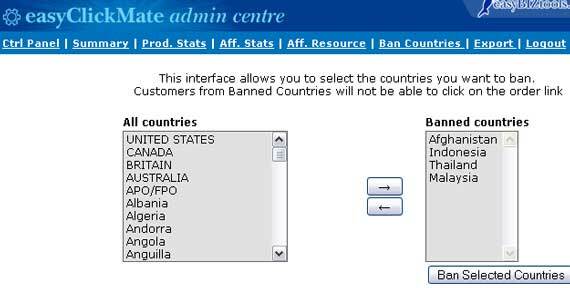 Just select the countries you want to ban (from the left colum), click on the and then click on the "Ban Selected Countries" button. To "un-ban" a country, select it from the right column, click and click on the button again to update the list. This powerful system gives you comprehensive marketing statistics such as click-throughs, sales and conversion ratio (hits/sales) of your affiliates. It will display your top performing affiliates, top referral urls, top products performance summary. Your affiliates can login to the affiliate center to check their stats, and retrieve their custom affiliate links which are automatically generated when you add new products. Take a look at the screenshot below. Your affiliates just need to select a product (from the drop down list) they want to promote, and click on the 'get link' button. Simple eh? Your affiliates will also receive an email notification from easyClickMateTM when they've made a sale. This is great for boosting your affiliates' morale and encourages them to promote harder. If you've browsed some of the popular marketing forums, you'll know that many Clickbank affiliates loves to get sales notification, but sadly, they don't - unless the vendor is using easyClickmate. You will also receive an email regarding the affiliate sale. First of all ... having played around with easyClickMateTM for the past few days I just want to tell you that I am impressed with it! You have done a fanastic job. It is extremely easy to set up and is really going to help our affiliates promote our products. When you invest in software for your business, you want to be sure that you will continute to receive support from the vendor in the years to come. You want to be certain that your investment will not become obsolete next year. You want to be sure that if you need support, you will NOT be ignored - even though you've purchased the software several years ago. This is where we are second to none. Since April 2002, we have been providing high quality software to Internet marketers and Entrepreneurs. We have seen many competitors bite the dust over the years, but we are still here for you!. Beau Blackwell (Clickbank) speaks highly of you and I can see why. Even though I purchased this product years ago, you're still around to give great support. Having been in the commercial internet space since it began in 1994, I've seen a lot of people come and go. Few have had the integrity and honesty of Adrian Ling. Adrian served as my webmaster for many years. Not only did he administer all the technical side, but I felt totally confident trusting him with my sensitive corporate data. Adrian's scripts are simple enough to install yourself, yet very robust. And if you get stuck, he offers fast personal support to get you up and running in no time. Author of three best selling marketing ebooks and the Internet Marketing Secrets Newsletter. I say this seriously because your customer service is IMPECCABLE! Always has been over the past 3 years that I have used your service. Again,I do appreciate your help and I'll wait for Charles to let you know what works for us. 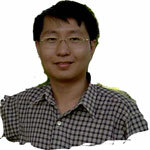 Adrian Ling is a rare breed among Internet Marketers. He produces unquestionably brilliant software tools, and is just about the nicest guy you could wish to meet. Adrian knows how to keep his customers happy with timely upgrades, and quick support, and I would recommend his products without even seeing them - that is the confidence I have in Adrian and his products. Adrian, your easyClickmate is fantastic. I love the way it organizes all my ClickBank products and allows me to manage my affiliates. I should have set this up a long time ago. I also want to thank you for your outstanding customer service. I had left this until the last minute, and was in a bit of a panic to get it set up before a deadline. Being in a rush, I of course bumbled part of the setting up. Unfortunately, my schedule fell right on your Chinese New Year -- an important time for you to take a holiday. However, you still were there to help me get it straightened out. I'm afraid I'm a bit of a klutz at times, but your unwavering help got me set up and running smoothly. I really appreciate your help. Quandary! I wanted to launch a second product with ClickBank and sell it via affiliates. Only two options possible: place it on the same page as the first (very restrictive) or spend $49 to open a new account. Problem solved with easyClickMateTM. Now I will launch EVERY future product with this tool; and also notify all my existing affiliates about this versatile tool. Plus there's a real helpful person at the end of the line. Thanks Adrian. Adrian, your product is great! It provides a wonderful way to manage affiliates, and be able to send people directly to the product that they want to advertise for you. It's much better than landing on a sales page with a ton of links. Thanks! I've just installed your script and it's working perfectly! This is a MUST have for every Clickbank Vendor. Affiliates are very important to my business, and now I have the perfect tool to enable them to link directly to each individual product! Manage Multiple Products With A Single Account - Effectively manage multiple products with a single ClickBank account across multiple websites! Increase Your chances Of Closing A Sale as each affiliate link is targeted directly to the correct product sales page! Vital Marketing Statistics - The comprehensive stats provided will help you fine-tune your marketing strategies and give you the extra edge over your competitors! Find out at a glance the conversion ratio for each of your products, your top affiliates, your top performing products, etc. Grow Your Subscriber List - Ask your affiliates to send visitors to your free newsletter. If they subscribe and make a purchase later, your affiliates will receive the commission. Boost Your Link Popularity - And Your WEB TRAFFIC - If your affiliates are using hoplinks, they're linking to Clickbank. However, if your affiliates are using easyClickMate's links, they will link back to your site! Imagine having hundreds or thousands of affiliates linking to you ... and watch your link popularity grow in the search engines! Professional Affiliate URLs to your product pages: e.g. Affiliates Management - Get them to register with you so that you can communicate with them and provide them with various marketing/promotional materials. You will have all your affiliates' data - name, email, nickname and date joined. This is powerful because when you want to launch your next product, you already have an army of affiliates ready to promote for you. You just need to compose an email and click 'send'. No need to scramble looking for affiliates. Email Notification of Affiliate Sales - Each time a registered affiliate, say, "fred" makes a sale, he will receive an email notification congratulating him on the sale. If you frequent some of the top marketing forums, you'll know that this is one feature which many affiliates look for. Now, you can offer it to them! Full Automation - Automated generation of the special URL Links for your affiliates. Saves you precious time. No need to hand-code messy html instructions for your affiliates. Your affiliates just need to login to the Affiliate Center, select the product they want to promote and click on the 'Get Link' button. Easy! Integration with 3rd party software. Easyclickmate will pass all the ClickBank return data to your backend software - e.g. Aweber, Getresponse, DLGuard, Amember, WP WishList, EasyDownProtector, EasyClickGuard, etc. If the software accepts returned parameters, it can be integrated. Sales Letter Personalization - You and your affiliates can now send subscribers to a personalized sales letter. This is guaranteed to boost the conversion rate. That's less than one dinner out for two. If you can boost your affiliate sales, increase your conversion, and attract more affiliates to promote your products for just $67, would you not do it? You may have noticed the absence of hype on this page. There is no need for hype. You have seen the facts for yourself. EasyClickMate is a piece of software that will let you to scale your ClickBank business. But don't just take my word for how good this product is. Install it, use it and let it prove itself to you. If you don't feel you have received at least $67 worth of value, I will give you back every single cent you have paid. No hesitation, no questions, no quibbles. 100% satisfaction guaranteed. I just picked up easyClickMateTM, and all I have to say is this ... easyClickMateTM should be an automatic purchase for all SERIOUS ClickBank Vendors. End of story. Just click on the Secured Order Link below and you'll be downloading within a couple of minutes. Remember, you get more than just a software. You're getting a tool that will help you boost your Clickbank profits! And my personal attention and support. Give it a try for 60 days - completely risk free! If you're not happy for whatever reason, I will insist on giving you back every cent you have paid. No hesitation, no questions. ClickBank® is a registered trademark of Keynetics Inc., a Delaware corporation. easybiztools.com is not affiliated with Keynetics Inc. in any way, nor does Keynetics Inc. sponsor or approve any easybiztools.com product. Keynetics Inc. expresses no opinion as to the correctness of any of the statements made by easybiztools.com in the materials on this Web page.